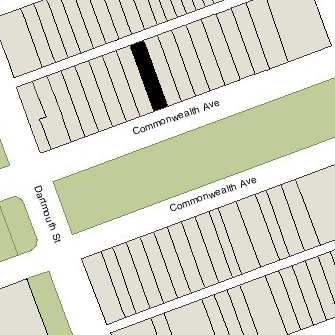 123 Commonwealth is located on the north side of Commonwealth, between Clarendon and Dartmouth, with 121 Commonwealth to the east and 125 Commonwealth to the west. 123 Commonwealth was designed by architect William G. Preston and built ca. 1872, one of two contiguous houses (123-125 Commonwealth). 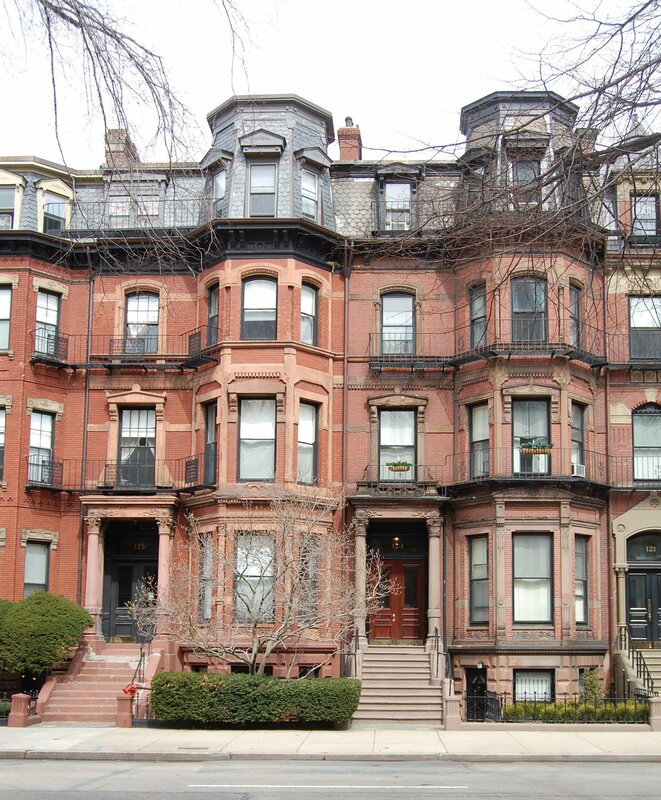 123 Commonwealth was built as the home of Mrs. Elizabeth Bishop (Beals) Kendall, widow of merchant Isaac Kendall and daughter of William Beals, co-founder of the Boston Post. She previously had lived at 16 Newbury. 125 Commonwealth was built at the same time for Elizabeth Kendall’s brother-in-law and sister, George W. Tuxbury and Harriett M. (Beals) Tuxbury. Elizabeth Kendall purchased the land for 123 Commonwealth on March 21, 1872 from real estate dealer Henry Whitwell. He had purchased it on March 25, 1871, from Charles Thorndike, who had purchased it from the Commonwealth of Massachusetts on June 13, 1865. Click here for an index to the deeds for 123 Commonwealth. 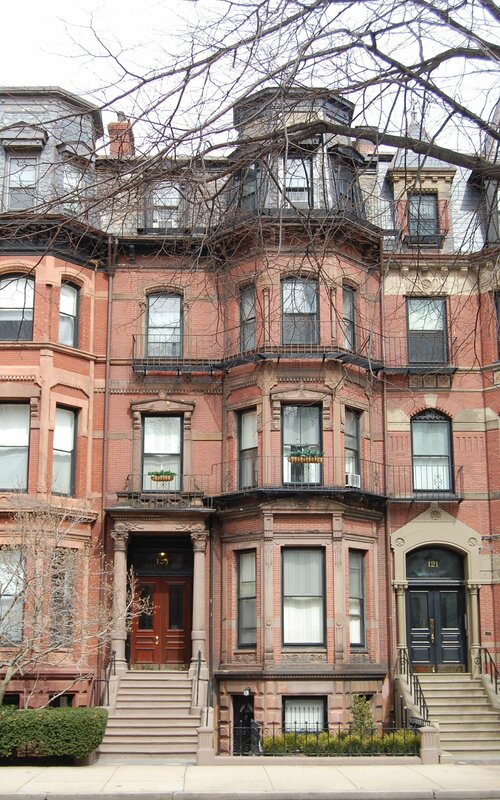 Elizabeth Kendall continued to live at 123 Commonwealth during the 1880-1881 winter season; her unmarried son, William Beals Kendall, a stockbroker, lived with her. They had moved by the 1881-1882 season, possibly to New York City, where William Kendall married in February of 1883 to Kate Varnum Whitney. 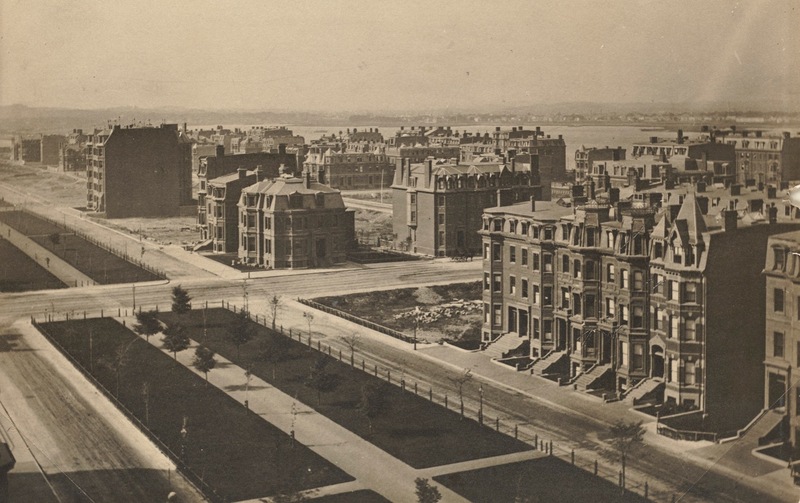 By the 1883-1884 season, Elizabeth Kendall was living at 321 Commonwealth. On January 25, 1881, 123 Commonwealth was purchased from Elizabeth Kendall by Elizabeth Nancy (Cummings) Butler, the wife of Charles Shorey Butler. He was a dealer in leather and hides. They previously had lived at 35 Union Park. 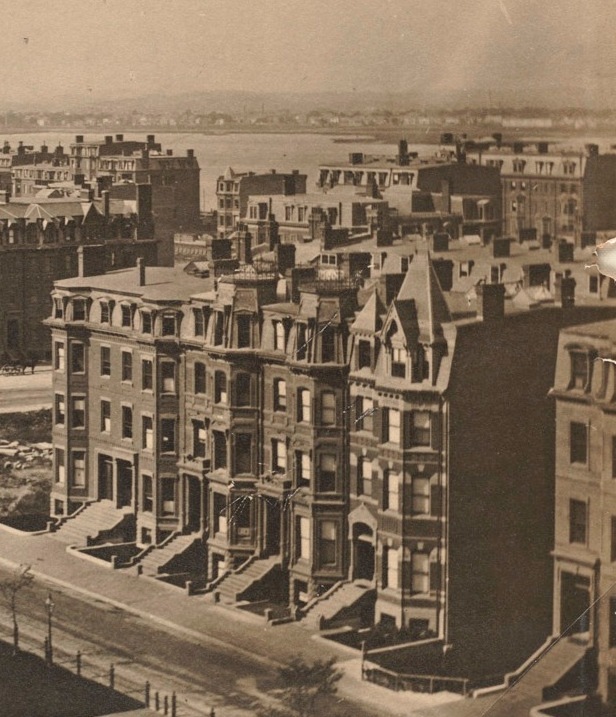 They continued to live at 123 Commonwealth during the 1884-1885 winter season, but moved thereafter to the Hotel Brunswick (southeast corner of Clarendon and Boylston). On June 15, 1885, 123 Commonwealth was purchased from Elizabeth Butler by Anna (Weld) Perkins, the wife of Naval Captain (later Commodore) George Hamilton Perkins. They previously had lived at 284 Marlborough. They also maintained a home in Webster, New Hampshire. Anna (Weld) Perkins was the daughter of shipping, railroad, and real estate magnate William Fletcher Weld. 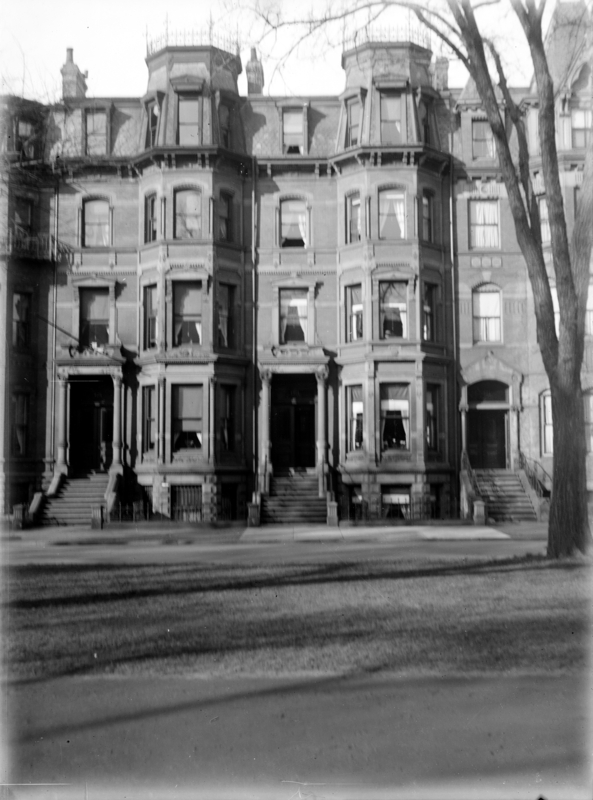 Her sister, Sarah Minot (Mrs. George) Pratt, lived at 127 Commonwealth, and their step-mother, Isabella (Walker) Weld, lived at 115 Commonwealth. Commodore Perkins died in October of 1899. Anna Perkins continued to live at 123 Commonwealth until her death in October of 1924. 123 Commonwealth was inherited by their daughter, Isabel Weld (Perkins) Anderson, the wife of Larz Anderson. 123 Commonwealth was not listed in the 1925-1927 Blue Books. Larz Anderson was a diplomat and, prior to his marriage to Isabel Perkins in June of 1897, served in the US Embassies in London and Rome. He served as Captain and Assistant Adjutant General of Volunteers during the Spanish American War, and in 1911, was appointed as Envoy Extraordinary and Minister to Belgium. In 1912-1913, he served as Ambassador to Japan. 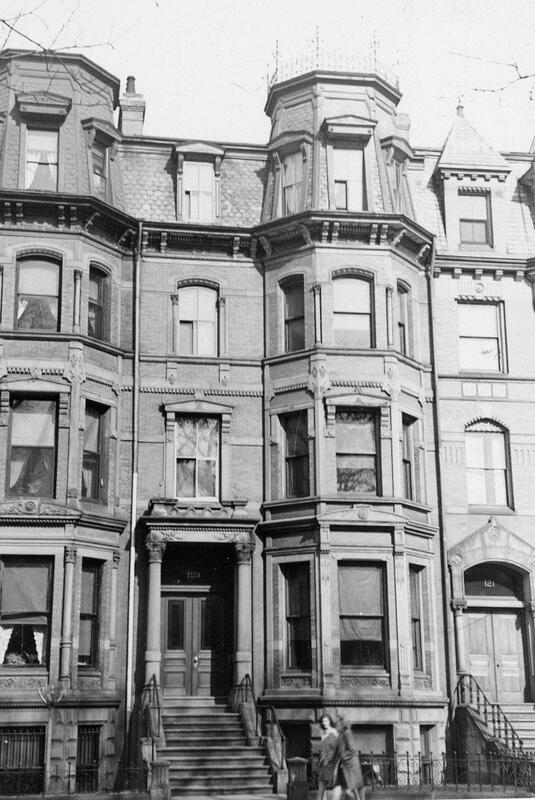 The Andersons also maintained a home, Weld, on Avon Street in Brookline and a home at 2118 Massachusetts Avenue in Washington DC designed by architects Little and Browne. Larz Anderson died in April of 1937. Isabelle Anderson continued to live at 123 Commonwealth until about 1943. On November 9, 1942, 123 Commonwealth was acquired from Isabel Anderson by the Navy League of the United States. On February 7, 1944, 123 Commonwealth was acquired from the Navy League by Joseph P. Brennan. The transfer was made pursuant to an order by the Superior Court. The property changed hands and on April 26, 1944, was acquired by Edward H. Whitney of Brighton, who operated it as a lodging house. The property subsequently changed and on February 26, 1946, was acquired by Samuel G. Rosenberg. In March of 1947, he filed an affidavit with the Building Department stating that, at the time he purchased the house, it was “listed with the OPA as a rooming house” and “had been run as a rooming house for many years,” and that he intended to continue to operate it as such. In January of 1947, he filed for (and subsequently received) permission to change the legal occupancy from a private dwelling to a lodging house. The property changed hands, remaining a lodging house through the 1950s. Among the longterm residents at 123 Commonwealth were Chalmers Murray and his wife, Harriette Rebecca (Evans) Murray, who lived there from about 1944. They previously had at 76 Marlborough. He was a photographer and concert violinist. In about 1954, they were joined by Harriette (Evans) Murray’s sister, Lois Bertha (Evans) Slingerland, the former wife of photographer Fay Ernest Slingerland. In the 1940s, before their divorce, they had lived at 76 Marlborough and then in Washington DC. Chalmers Murray died in April of 1954 and Harriette Murray moved to Florida to live with their son, Chalmers, Jr. Lois Slingerland continued as a lodger at 123 Commonwealth until about 1958. She also maintained a home in Hingham. On September 30, 1964, 123 Commonwealth was acquired from the Zirkles by Daniel H. Ferguson and his wife, Joan M. Ferguson. 123 Commonwealth remained an apartment house in 2016.